In Railroad Ink, your goal is to connect as many cities on your board as possible. Each round, a set of dice are rolled in the middle of the table, determining which kind of road and railway routes are available to all players. You have to draw these routes on your erasable boards to create transport lines and connect your cities, trying to optimize the available symbols better than your opponents. The more cities you connect, the more points you score at the end of the game, but you lose points for each incomplete route, so plan carefully! Will you press your luck and try to stretch your transportation network to the next city, or will you play it safe and start a new, simpler to manage route? 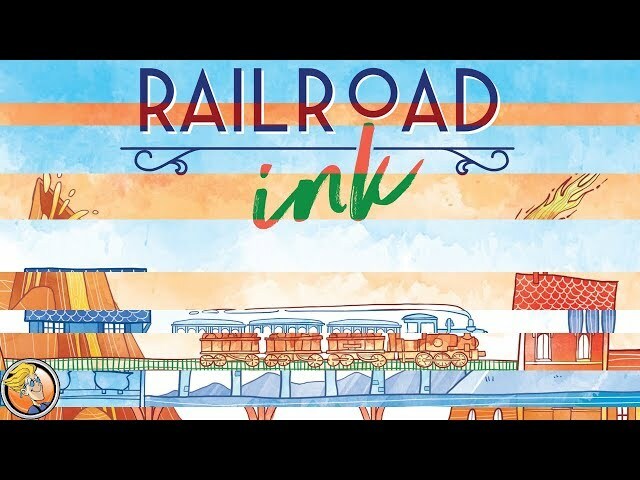 Railroad Ink comes in two versions, each one including two additional dice sets that add new special rules to your games. Ranging from lakes and rivers to keep in mind while planning your routes, to meteor strikes and volcanoes to deal with and avoid, these special rules can spice up things and make each game play and feel different. Each box allows you to play with 2-6 players, and if you combine more boxes, you can play with up to 12 players (or more). The only limit to the number of players is the number of boards you have! Buy Railroad Ink for a multiplayer puzzle game of track and thinking. Read more about Railroad Ink in the articles The Best Board Games of 2018 (so far) and Top 6 Super Stocking Stuffer Board Games 2018.